Janell Weinstein is an attorney and legal commentator on television and radio. Her practice includes divorce, child support, alimony, custody, post divorce judgment matters, domestic violence, domestic partnerships and premarital agreements; and civil litigation. Janell was born in London, England. She received a B.A. from Rutgers University, Douglass College in 1988. While in college, she was an Intern for the Northeast Midwest Congressional Coalition in Washington D.C., attending Congressional hearings and markups of legislation, and performing extensive research and written analysis of legislative issues at that time. 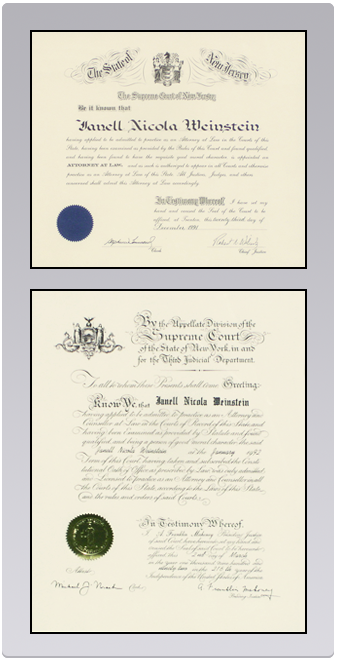 Janell was awarded a Juris Doctor in 1991 from Hofstra University School of Law. Upon receiving her law degree, Janell served as a judicial law clerk for the Honorable Jonathan N. Harris, in the Criminal Part of the Superior Court in New Jersey. As a judicial clerk, she was trained as a mediator in landlord/ tenant and small claims matters. After being a partner at the firm of Federbusch & Weinstein for many years, Janell joined the law firm of Melli, Guerin, Wall & Frankland, specializing in family/divorce and real estate matters. In February 2013, Janell joined the prestigious law firm of Sunshine, Atkins, Minassian, Tafuri, D’Amato & Beane. The firm is well known for their concentration in family law matters. Sunshine Atkins also provides legal services in the areas of personal injury, wills and estate planning, criminal and municipal court matters, and other civil litigation. She is frequently called to give her expert opinion on television and radio. Janell appears regularly as a guest commentator for Fox News on programs such as Your World with Neil Cavuto, Shepard Smith Reporting and Fox and Friends. She also appears on CNN, HLN, Inside Edition, The Bill Cunningham Show, WPIX- NY, TruTV’s In Session( formerly COURT TV), LXTV-NBC and Daybreak (formerly GMTV) in the United Kingdom. Janell was a legal correspondent for the “Vinnie & Me” show on Sirius/XM and continues to speak on various radio programs such as FOX News Radio and 77WABC with Rita Cosby discussing current legal issues. As a frequent guest on “The Ralphie Radio Show” which aired on 97 BHT in Pennsylvania and 92 ProFM in Rhode Island, Janell would talk about celebrity legal issues. As a guest on “The World of TJ McCormack” on LaTalkRadio.com, she discusses pop culture issues and family matters. In addition to her television and radio appearances, Janell is a writer and contributing legal expert for FirstWivesWorld.com, a website that focuses exclusively on family and divorce issues. She has been interviewed by many print media outlets to give her legal opinion. Janell has been quoted in newspapers such as the San Francisco Chronicle and the Bergen Record. Janell is admitted to practice in the State of New Jersey, the State of New York, United States District Court, District of New Jersey and United States District Court, Southern District of New York. She is presently a member of the New Jersey State Bar Association, and a member of the Family Law Committee of the Bergen County Bar Association, as well as a Master for the New Jersey Family Law Inns of Court. She was nominated and served as a member of the Fee Arbitration Committee for three years, and has been a panel member for matrimonial seminars conducted by the New Jersey Institue for Continuing Legal Education. She presently serves as an Early Settlement panelist for the Family Part in the Superior Court of New Jersey and volunteers at the Women’s Rights Information Center in Englewood, New Jersey.